As we embark on this migration to Kubernetes, it’s even more important that we provide the same logging capabilities that we have on our current platform. Being reliant on logs written to disk simply isn’t an option anymore; pods come and go on a frequent basis, and logs for those pods are only kept for a small buffer window. It all becomes a moving target. Saturation: This approach collects all container logs across your cluster. Some applications are incredibly noisy and the impact of the large ingest volume they cause often isn’t worth the benefit they provide. Logging everything is cool, but it isn’t necessary. Multiline & Parsing: Logs come in all shapes and size, from Nginx access logs to multiline JSON blobs. Logs often arrive in Elasticsearch malformed and parsing them into meaningful fields is difficult. What we really wanted was to provide an opt-in Logging as a service to our end users deploying software to our Kubernetes cluster, that allows them to get meaningful log messages without having to understand the complexities of our Elastic stack. This post is going to cover how we’ve implemented a solution to achieve this using Elastic Filebeat. We wanted to find a way to provide self-serve filtering and log-parsing functionality to our users so that the logs presented in Kibana are as useful as possible. The story begins the same. We run a Filebeat DaemonSet that mounts the underlying host’s container logs directory so that Filebeat can see and read all the container logs. We want Filebeat to run on every node, regardless of any taints it has so that we guarantee we’re getting all the logs that we’re after. Filebeat keeps a registry of which line in each file it has processed up to. If the registry data is not written to a persistent location (in this example a file on the underlying nodes filesystem) then you risk Filebeat processing duplicate messages if any of the pods are restarted. The hints are something we’ll cover a bit further down. Even better though is that we can drop messages based on the content within them, allowing us to create our opt-in logging model. A user simply needs to add the annotation autotrader/logging: 'true' to their deployment pod template to get their log messages into Elasticsearch, instead of them being dropped. We’ve now got our logs conditionally being sent to Elasticsearch based on the presence of an annotation, but we’ve not yet tackled providing some better parsing of those log messages. This is where the hints based discovery comes in. 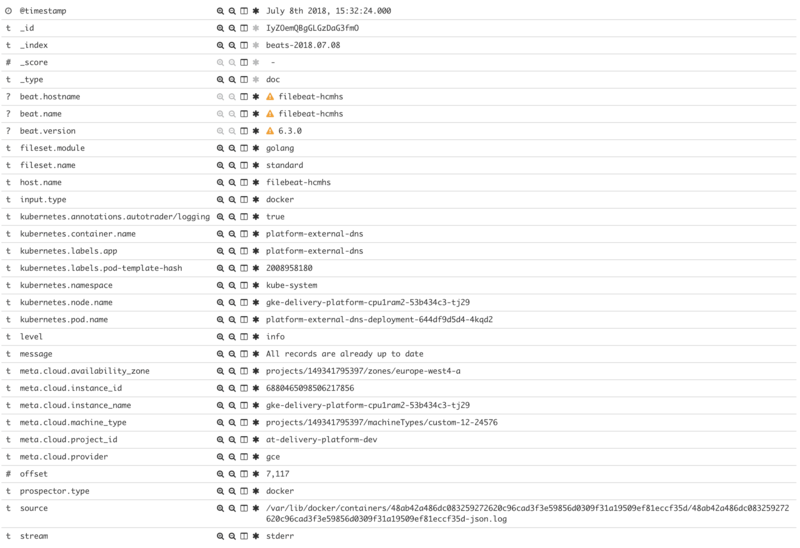 Through a few simple annotations, we can begin to correctly ingest the majority of our log messages. This is great you’ll hopefully be thinking: but it’s a bit of a pain if a user needs to specify processing rules in every deployment, and even then we’re still not parsing the actual message field into meaningful content. There’s not that many log formats, perhaps we can make it even easier for the end user. Fortunately, we can take things one step further, using modules. If you read the autodiscover docs linked above you may have seen an annotation for co.elastic.logs/module. Filebeat modules are prepackaged definitions for how a given log format should be parsed. They can include processing rules for log lines with different rules for different ‘filesets’ (i.e. stdout vs stderr), Elasticsearch field mappings & premade dashboards for Kibana. I won’t go through a full example of creating a module since there are quite a few files you have to fiddle with, but following this guide got us to where we wanted to be. We used the official Filebeat Docker image and built on top from there. time="2018-07-08T14:13:35Z" level=info msg="All records are already up to date"
Currently, this would be ingested into Elasticsearch as is, the message field would simply be the entire log line. Ideally, we want to split this out; derive the timestamp from the time in the log line, split the log level into its own field, and keep the message on its own. As part of creating a module, we can define an ingest pipeline definition that should be used to process the logs. Ingest pipelines are run on Elasticsearch ingest nodes before a document is indexed, they’re almost like a Logstash-lite built into Elasticsearch. Now that we’ve created a module in Filebeat and given it a name, i.e. example-module, users can make use of it by specifying it in their annotations: co.elastic.logs/module: 'example-module'. This is great because we can create generic modules for different log formats (Common Log Format, logfmt etc. ), taking the burden of writing parsing rules off the end user. Finally, you can sit back and bear the fruits of your labour; meaningful, rich & structured logs. Using the above resource definitions Filebeat will not automatically pickup config changes. If you’re using Helm you can have pods restart on Secret/ConfigMap changes with this method. Alternatively, you could enable Filebeat’s automatic reload option. Most of the Filebeat features outlined in this run through are classed as beta or even experimental, so you may choose to opt for a more mature solution. If you’re using modules with ingest pipelines keep an eye on Elasticsearch to ensure you don’t degrade search/index performance. You could consider running dedicated ingest nodes if you’re ingesting a lot of documents. When you change an ingest pipeline in a module the definition within Elasticsearch is not updated with the changes, you need to run filebeat setup to force the update. Hopefully, this has given a taste of how you can streamline your Kubernetes logging. If you have any questions or suggestions for improvement feel free to get in touch on Slack: evesy @ kubernetes.slack.com.